Roe v. Wade divided the country into those who believed in an unborn child's right to life and those who believed in a woman's right to choose. It raised issues of morality and privacy and is still hotly debated today. In the early 1970s, Norma McCorvey (alias Jane Roe) was a single Texas mother. Pregnant for a third time, McCorvey decided she did not want to bear a third child, but Texas state law prevented her from having an abortion. On Jan. 22, 1973, the U.S. Supreme Court ruled that the constitutional right to privacy extends to a woman's decision to have an abortion. 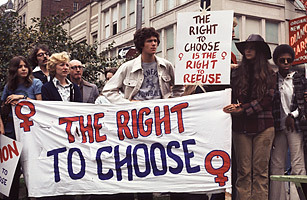 The decision came too late for Roe, who was impregnated in 1969 (she had the child and gave it up for adoption), but it guaranteed the right of women nationwide to terminate unwanted pregnancies through abortion by obliging all 50 states to legalize the divisive medical practice. Dissenting justice Byron White wrote that the Court could not value the rights of a pregnant woman over the existence of her unborn child. Dissenting justice William Rehnquist wrote that the Fourteenth Amendment did not encompass the right to terminate a pregnancy and that all previous Courts had upheld legislation prohibiting abortion. Watch a time-lapse video of Elena Kagan's Senate hearing.